As some of you may be aware, the obscure British novelist J.K. Rowling released a book this past weekend. 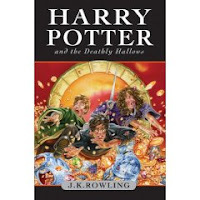 Harry Potter and the Deathly Hallows went on sale with little fanfare, and I managed to secure one of the few copies that was released on this side of the pond.Having spent a few long nights working through the 600 page tome, I was left with a few thoughts that I wanted to share with you1. Some people may have been shocked with the revelation that Voldemort is Harry’s real father, but I saw that one coming several books ago. I mean, it was obvious. Still, when Voldemort sliced off Harry’s hand with the sword of Gryffindor and revealed this great secret, it was pretty rivetingVoldemort: Dumbledore never told you what happened to your father.Harry: He told me enough! He told me you killed him!Voldemort: No, Luke, I mean Harry… I am your father!Harry: No. It can’t be. That’s not true. That’s impossible!Voldemort: Search your feelings Harry… you know them to be true.Harry: Noooooo!2. I was not prepared for Rowling’s increasing preoccupation with adolescent sexual awakening. She had hinted at it in the last couple of books with the odd stolen kiss, but with the main characters turning 17 in this book, suddenly everyone was hooking up. Harry & Ginny, Harry & Cho, Harry & Hermione, Hermione & Ron, Ron & Professor Trelawney…However, it was the Harry & Ron & Hermione episode, brought on by the trois menageious curse, that really got me. At nearly 40 pages, it seemed more like Clan of the Cave Bear than Harry Potter3. In a weird chapter, Harry and his friends traveled to Afghanistan in search of a Horcrux. While searching the many caves in Tora Bora, they came across bin Laden, killed him with the avada kedavra curse, and collected the $50 million bounty from the U.S. government. I don’t know if Rowling was taking a shot at George W. here (British kids accomplish in one day what U.S. special forces have failed to do in 6 years), but it seemed out of place.Despite some of these oddities, I enjoyed the book overall and give it a mild endorsement. I can only hope that Ms. Rowling gives up these wizard stories and goes with something a bit more commercial for her next effort.